Welcome to Under the Spotlight, a monthly interview series which offers a snapshot from academics’ lives: their passions, interests and reading suggestions – all summarised in less than ten minutes. You can catch up with previous posts here. 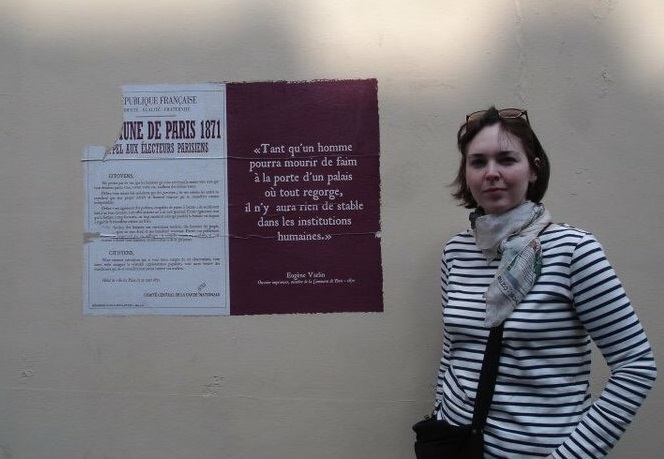 Laura O’Brien is Senior Lecturer in Modern European History at Northumbria University, and Head of Postgraduates for the Centre for Nineteenth-Century Studies. Her current project investigates Napoleonic performance in French theatre and film. In the length of a tweet, what is your research about? Representation, memory, belief and, increasingly, performance in modern France. My current preoccupation is how French theatre and cinema constructed what it meant to be ‘Napoleonic’. I spend a lot of time looking at men in bicornes and big coats making a ‘Napoleon face’. My love of France and French culture is (almost) lifelong, and something I developed all by myself. It was fostered along the way, though, by Usborne ‘Teach Yourself French’ books borrowed from Navan Library and kind people like my aunt Mary, who was the first person to draw my attention to this thing called the French Revolution, via an article in a 1989 issue of an American children’s magazine. That said, I think there are two long-term root causes for why I was such a weirdly France-obsessed person from a young age: Lourdes, and the Tour de France. When I was small, I was fixated with the story of the Marian shrine at Lourdes. Only two people in my family had ever been to France – my paternal grandmother and my aunt, who visited Lourdes on a pilgrimage in the 1970s. My granny returned with a Lourdes guidebook, and as a small child I read it over and over, cover to cover, absorbing every detail (especially the pictures). Years later, when I was starting my PhD, I read Ruth Harris’ marvellous Lourdes: Body and Spirit in the Secular Age, and it was like coming home. So from an early age I had this awareness of a place and time called ‘nineteenth-century France’, and I was fascinated by it – at least, back then, by the apparitions and holy pictures. And then there is the Tour de France, a staple of our summer television diet as far back as I can remember. My dad watched the evening highlights programme when he got in from work, so I grew up watching this remarkable country unfolding before my eyes: from coast to mountains to forests, and all the historic sites along the way. Above all, though, the Tour’s final, triumphal stage fixed Paris in my mind as this magical place. When I went to University College Dublin, I was lucky enough to be taught by people who cared deeply about European cultural history, and encouraged me to explore new areas and ideas. How could I resist French history, after an opening first-year lecture on the French Revolution that was illustrated with increasingly graphic caricatures? This is a tricky one. I’ve always loved the idea of nipping back to the Galerie Véro-Dodat, off the rue Jean-Jacques Rousseau in central Paris, sometime around 1833. There, I’d call to the shop and offices of the Maison Aubert, home of the satirical journals La Caricature and Le Charivari. In addition to finally finding out how the shop was laid out (and maybe buying some prints and pencils to bring back – still my favourite souvenirs), I would sneak into the back rooms to see the editors, journalists and cartoonists at work. I have multiple themed guest lists that would be fun to host: a load of mid nineteenth-century cartoonists, for whom I would serve a course of pears; or a party entirely comprised of some of the nineteenth and twentieth-century stage and screen Napoleons I have been working on of late. They would probably refuse to break character all night. But if I can only have one party, then it will have to be quite a large one, and the guest list will be rather varied (to reflect my range of interests). First in: Charles Philipon, founder and editor of the satirical journals La Caricature, Le Charivari, and Le Journal pour rire, and with him the wonderful Felix Nadar, who could take a group photo and spill the beans on the tout-Paris once he’d had a wine or three. Then, the brilliant feminist and socialist activist Jeanne Deroin (who I’d encourage to tear strips off the cartoonists for their anti-feminist antics in 1848). Daniel Stern, aka Marie d’Agoult, would bring intelligence and elegance to the proceedings – I’d love to talk to her about her history of 1848. I suspect that most of the mid nineteenth-century religious figures I’ve worked on would be tedious dinner guests, though I think I owe it to my younger self to invite Bernadette Soubirous, the visionary at Lourdes, so we could finally hear her side of the story. Finally, there would have to be a carefully selected ‘Napoleon in theatre and cinema’ contingent, primarily composed of performers: Talma, of course; Gobert, one of the great Napoleons of boulevard theatre in the 1830s (rumoured to have thought he was Napoleon); Virginie Déjazet, who played the young Bonaparte in the 1830s and had an incredible career as actor and theatre owner; and Edmond Duquesne, who originated the part of Napoleon in Sardou’s Madame Sans-Gêne on stage and screen (also rumoured to have thought he was Napoleon). From cinema: Émile Drain, who played Napoleon on screen more times than anyone else and, of course, Abel Gance and Albert Dieudonné (you guessed it – also the subject of rumours about Napoleonic delusion). With all those would-be Bonapartes around the table, we would be in for an interesting evening. Most rewarding: being part of a friendly, diverse, and global community of scholars – sometimes Academic Twitter drives me mad, but in the last few years it’s been a wonderful way to feel part of a group of scholars based all over the world. When students reach that ‘aha!’ moment, especially when grappling with something new and challenging. Being supported and encouraged in pursuing new research interests, even the, er, more ‘unusual’ ones. And, of course: getting to spend time in Paris working on all sorts of wonderful material. Most frustrating: this is a common refrain on ‘Under the Spotlight’, but the decline in language learning in the UK is a real pain. This is frustrating for me as someone who teaches French history, but perhaps even more so for the students who are unable to pursue their interests in French history. Given that access to language learning here is so closely linked to economic status, educational background, and class, this will also have dire consequences for diversity within the future community of French historians in the UK. What one change would you like to see in Academia during the next 5 years? Specifically within the UK: it would be nice if certain elements in the media and politics (including in government) could just give universities (especially ‘new universities’) more of a break. This isn’t to say we’re perfect, but our students overwhelmingly tell us we do a good job and our research is (to use the official terminology) ‘world-leading’. You would not think that was the case, based on the representation of universities in news stories and by certain politicians. More generally: fairer pay, fairer workloads and conditions, greater effort to address a lack of diversity in leadership positions. And a ban on the term ‘alt-ac’ (alternative academia) to describe anyone who doesn’t follow an academic career after a PhD. Running the world’s least organised bookshop, or leading guided tours across France and Ireland. I am very much in love with the refurbished Arts du spectacle department at the BnF Richelieu, especially the adjacent exhibition space with a glorious view onto the Rondel Collection. However, the Bibliothèque historique de la Ville de Paris will always be my favourite Parisian library. That depends how well the writing is going! I increasingly like using some kind of white noise as a background: something like Noisli (suggested by Sara Barker), or the myriad sounds on MyNoise. Their ‘Irish Coast’ sound is lovely to work to (and helps with bouts of homesickness). Can I say hot chocolate? Preferably from the Patisserie Viennoise on the rue de l’École de Médecine: a chocolat chaud so thick your spoon almost stands up in it. SSFH 2007 in St Andrews was the first French history conference I ever attended. Apart from the papers I heard and having the chance to present my own work in that forum for the first time, it will always be special because it introduced me to an incredibly welcoming and friendly community of scholars. Brilliant interview and insight to a scholars life but then I would have to say this being her dad!